Here’s a rough mock up of something I’ve been working on. It’s not quite how I want it yet. 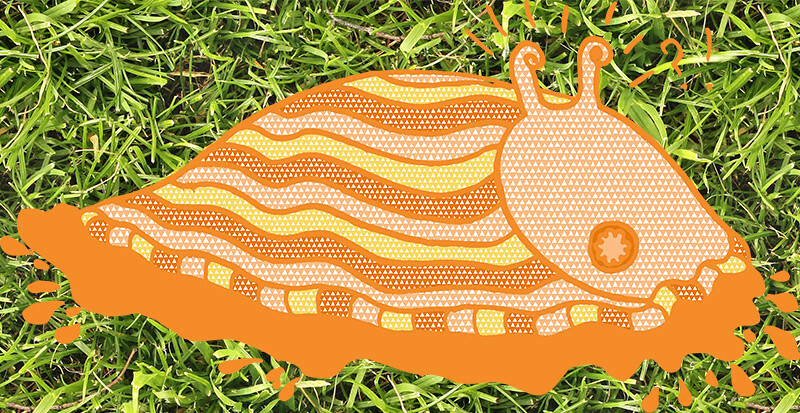 When I was younger I had a book called Nature All Around (I scanned it in this post) and it had a picture of a big orange slug that used to disgust and fascinate me. A few years ago I lived across the road from a fish and chip shop with a poster in the window advertising the “new masala cod”. The photo was a lurid orange, and looked a lot like a less frilly version of what I’ve drawn. If you bought a masala cod late at night and forgot to eat it, I always imagined it would creep along the carpet in the night and smother you like a terrible 70s horror film. The work above is really pretty cool. The real orange slug is disgusting. The same chain reaction every time and it was my job to set 'em back outside. If there had been one of those orange jobs in the house…we would have had to call the neighbors. I have a vivid memory of running out into the garden with bare feet when I was a kid and putting my bare foot straight down on an enormous slug. When I was a student, one place I lived in had a basement kitchen with a nightly slug problem. We ended up with a denfensive salt line around the edge of the kitchen because we couldn't figure out where they were getting in. It looked like we were doing some kind of magic ritual.